Anemones are animals belonging to the order Actiniaria in the class Anthozoa. Some anemone species are highly sought after and pampered by aquarists, while other species spread really fast and can turn into a pest in the aquarium. 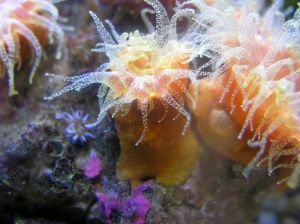 Anemones are stingy and having a lot of anemones in the aquarium can cause problems for other inhabitants such as fishes and corals. A majority of the known species of anemone lives on coral reefs in tropical waters but there are also species that prefer other habitats, e.g. sandy bottoms or kelp forests. Anemones have a foot which they use to attach themselves to a surface, e.g. coral, kelp or a stone, but some species drift around in the ocean instead of using their foot. As you can see, it is very important to research the preferences the species you are interested before selecting it for your aquarium. It is also important to keep in mind that some anemone species live outside the tropics and should therefore not be kept in tropical aquariums. Anemones are chiefly filter feeders, i.e. they will filter the water and feed on tiny organic particles the floats around in the ocean. There are however many species that enter into symbiotic relationships with green algae capable of photosynthesis. By doing this, the anemone doesn’t have to relay on currents bringing it suitable food; it will receive nutrients from the algae. It will also be able to absorb the oxygen that is produced as a bi-product of photosynthesis. The green algae benefit from the relationship since it is better to be attached to a well lit place than to float around randomly in the ocean and risk being swept to a spot where light is scarce. The green algae will live inside special cells on the anemone. Green algae are not the only creatures interested in working together with the stingy anemones. You have probably seen clown fishes, also known as anemone fishes, in saltwater aquariums. In the wild, a small and colourful little fellow like the clown fish would easily become food but the clown fish has solved to problem by co-habiting with stingy anemones. They anemone will keep the clown fish safe and the clown fish will keep the anemone clean by removing uneaten food and dead tentacles. Exactly how the clown fish avoids getting stung remains a mystery. Hermit crabs and anemones are also known to benefit from each other. Some anemones will attach themselves to the shell of hermit crabs, and hermit crabs have also been seen collecting anemones and arranging them on top of the shell. The anemone likes to live on top of a hermit crab since it can eat all the tiny pieces of food that forms a cloud around the hermit crab when it devours prey. In return, the stingy anemone will protect the hermit crab from predators. As mentioned above, anemones have developed to fit into various environments and niches in the wild and it is therefore very important to research the species you are interested in before you bring it home. Never assume that two species of anemone will appreciate the same type of care simply because they are anemones.